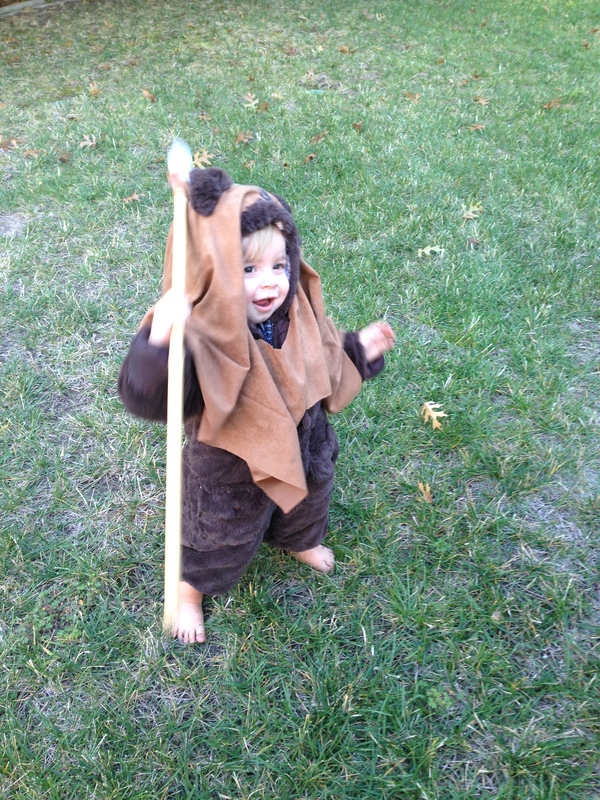 Happy Halloween from baby ewok! 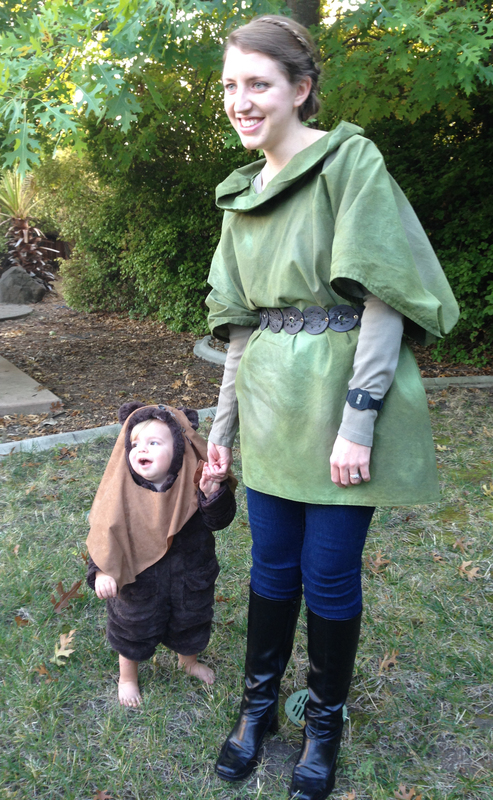 Happy Halloween from the forest moon of Endor! 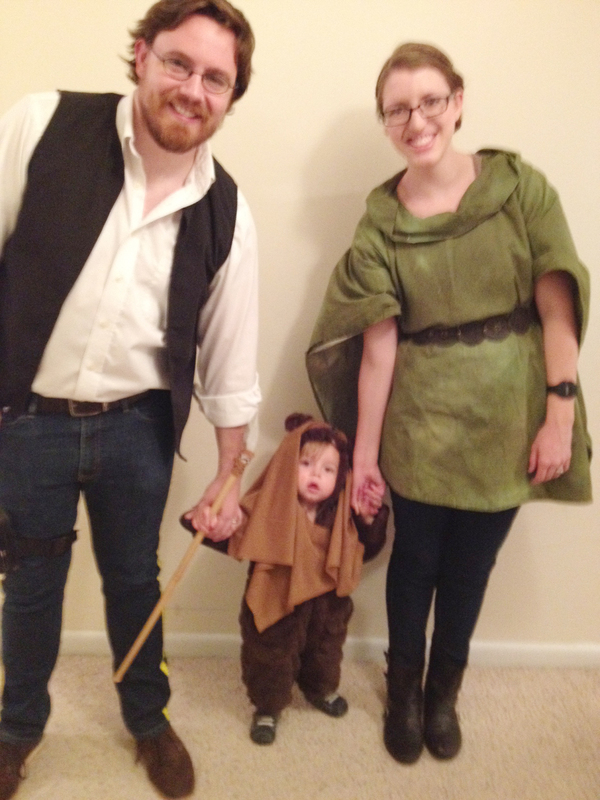 After strategically calculating the cutest possible costume for our child, we settled on ewok. You be the judge. Some people suggested that I go with the white-robe-and-cinnamon-roll-buns Leia because it’s more recognizable (and metal-bikini Leia just ain’t my style) but I was adamant that I dress as Endor Leia, to be consistent with the ewok, you know? My costume isn’t nearly as detailed as the Comic-Con crowd (see my costumes pinboard to check out some impressive cosplays, as the kids call ’em), but this is by far the most effort I’ve put into a Halloween costume, and it was a lot of fun. Full credit for most of the costume creation goes to my awesome mom. Happy Halloween, everyone! And may the force be with you. :: The Return of the Jedi has always been my favorite in the Star Wars series. You are required to share your favorite film in the comments. :: Did anyone else watch those made-for-TV Ewok Adventure movies? My brothers and I loved them, and got so mad when my mom got rid of the VHS. In retrospect, it was kind of violent and the orphaned-girl plot was sad. Not sure what appealed to us so much. :: Doesn’t it blow your mind that they never say the word “ewok” in the movies? I didn’t believe it when I first read that, but it’s true! 3. 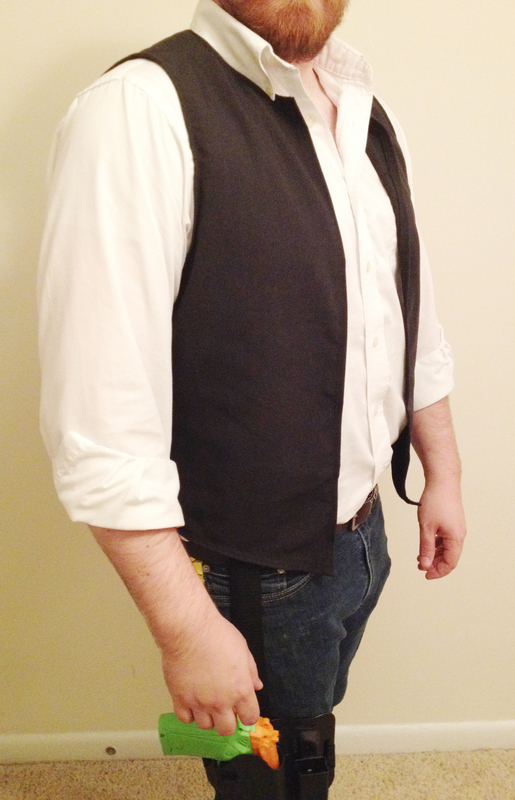 Put on the vest over the shirt. Either button down the collar or flip it inward so it looks more like Han’s shirt (you could make your own shirt, but we were doing the quick and dirty version). 4. Stick a strip of tape on the outer side of each pant leg. Draw horizontal stripes on the tape. 5. 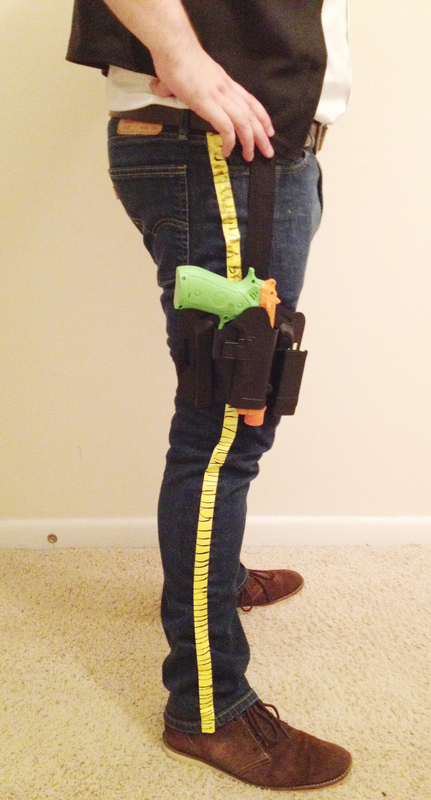 Attach the holster to your belt. 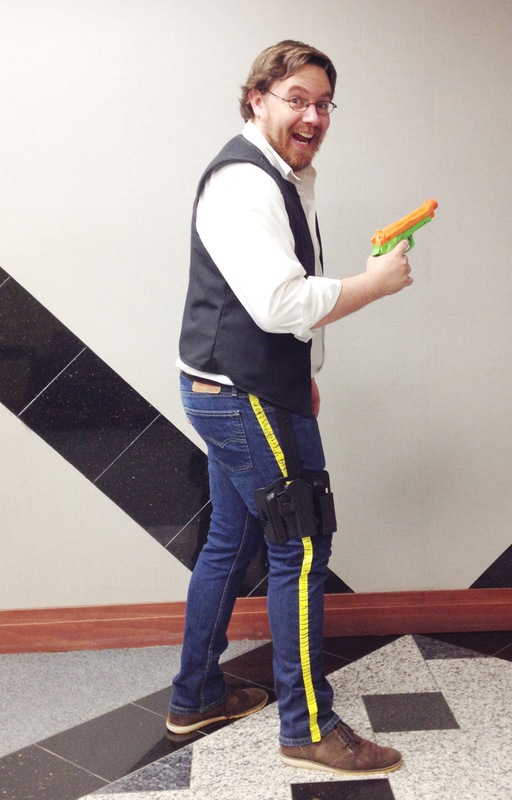 Wield a toy gun (ideally a blaster, if you’re really on top of things–we didn’t go that route because they’re pretty expensive). 6. Be a charming scoundrel. But don’t get cocky, kid. 1. 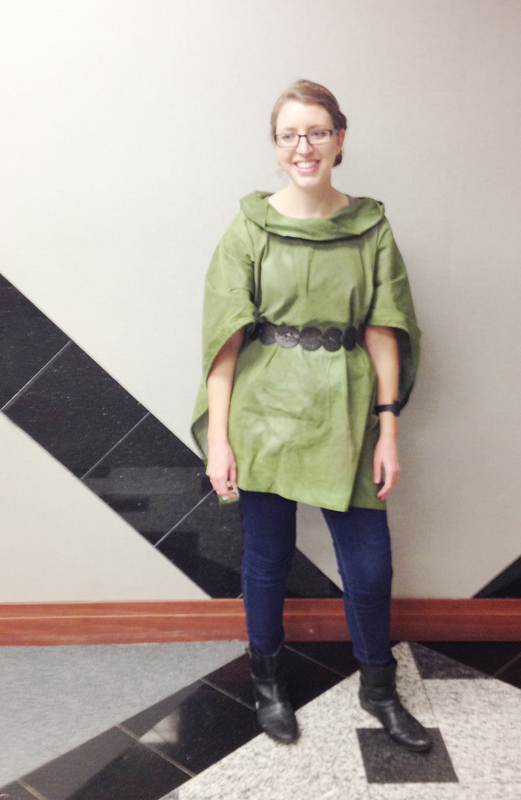 To make the camo poncho, measure the green fabric so that it drapes at the length of a tunic (mine was about 3 feet wide and 5 feet long). 2. In the center, cut out a circle about 5 inches in diameter. 3. 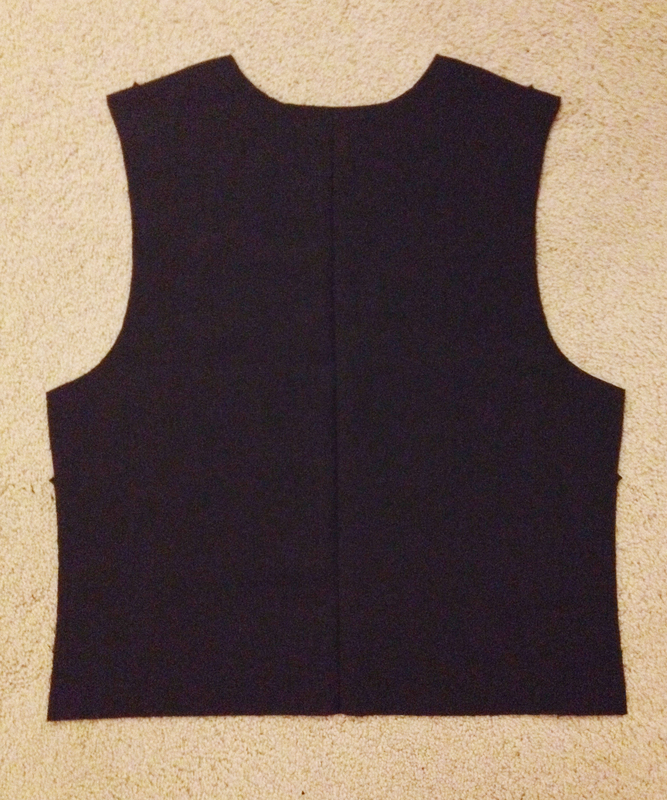 Cut a strip of fabric about 8 inches wide and 2 feet long. 4. Fold the strip lengthwise with the green facing out. Sew along the edge of the circular hole in the middle of the cape. Alas, I didn’t catch any pictures of this step, but this tutorial is the closest approximation of what we did. 5. Lay out the sewn poncho outside on newspaper or other paint-safe surface. 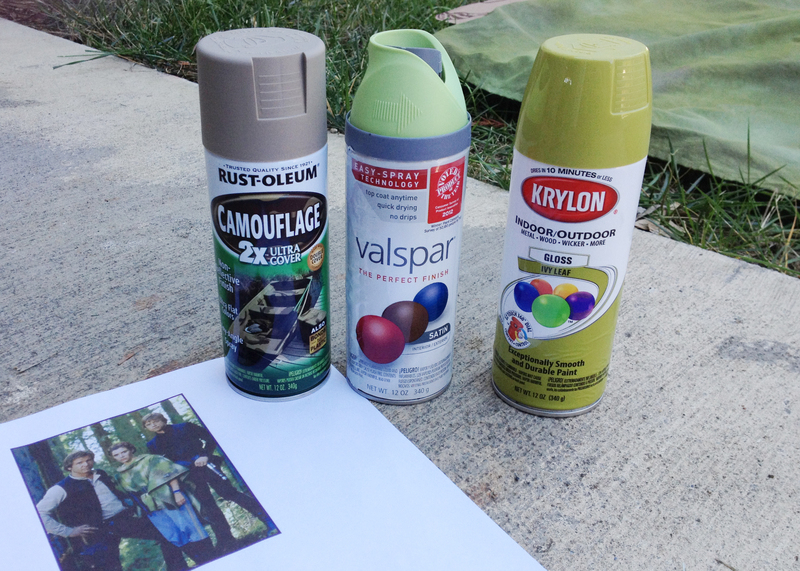 Spray paint splotches of various shades of green and brown to create a camo effect (with a pic of the original Endor Leia poncho on hand for reference). Let dry. 6. To style your hair, first check out these shots of Leia’s hairstyle. And feel free to google other tutorials that may be fancier/more useful than mine. 7. 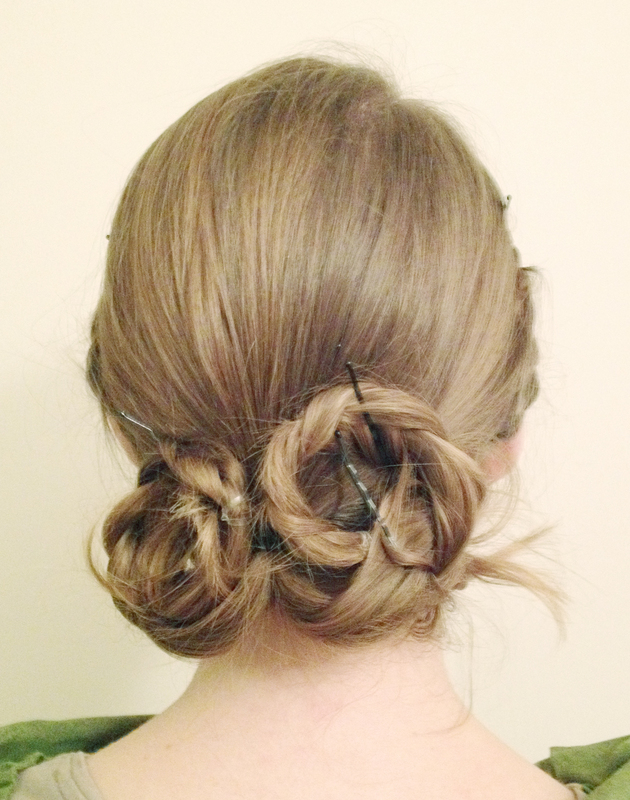 Separate a section of hair right behind each ear and braid it, securing each braid with an elastic. 8. 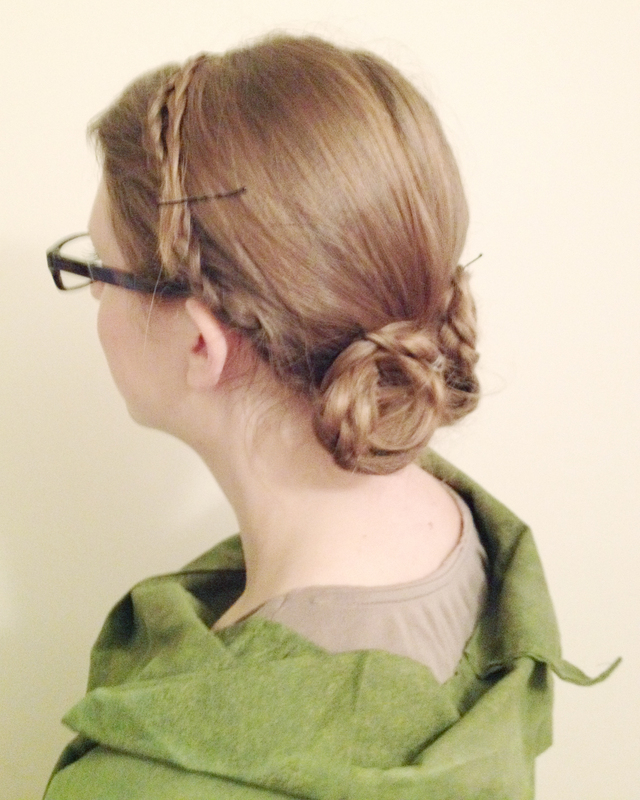 Pull the rest of your hair into low pigtails and secure with elastics. 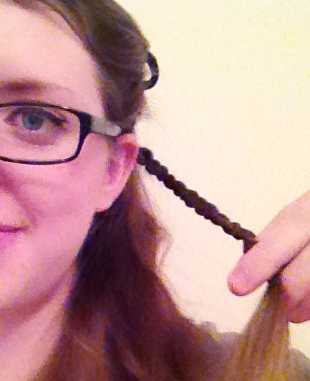 Braid each pigtail and secure each braid with an elastic. 9. Take the behind-the-ears braids and pull them toward each other, arranging them on your head like a headband. If you want to give it that special ewok touch (and if you have a friend to offer a helping hand), wrap some twine or yarn around the braids. Pin firmly in place. 10. Drape the poncho over your shirt. 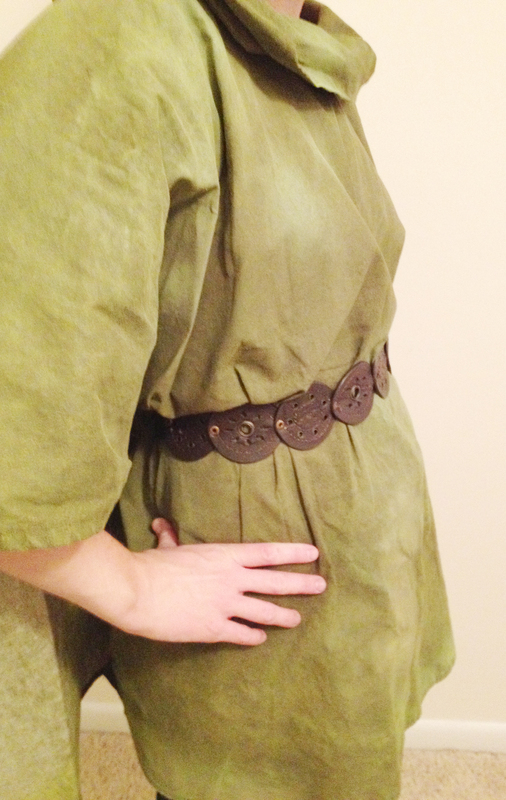 Belt the front of the poncho to your waist, leaving the back loose like a cape. Add a watch and boots–and a blaster, if you have one! Note: The great news about this costume is that the look is very rough, so it doesn’t have to be perfect! 1. Buy a furry hooded bear suit from your local Goodwill (I visited two stores and there were a half-dozen cheap baby/toddler bear suits at each). 2. 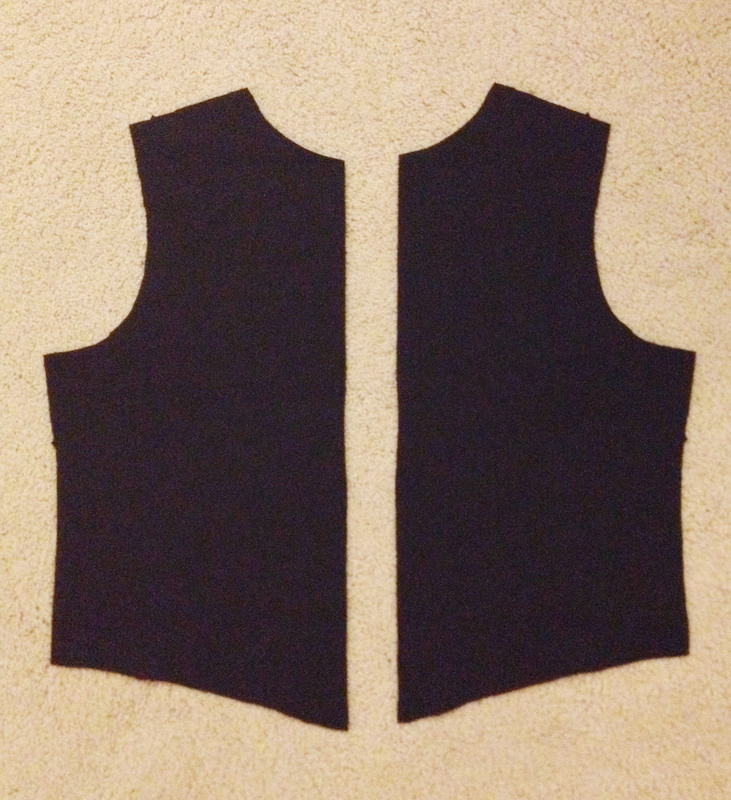 Cut off the feet of the suit and fold into an ear shape. Stitch onto the hood of the suit. 4. 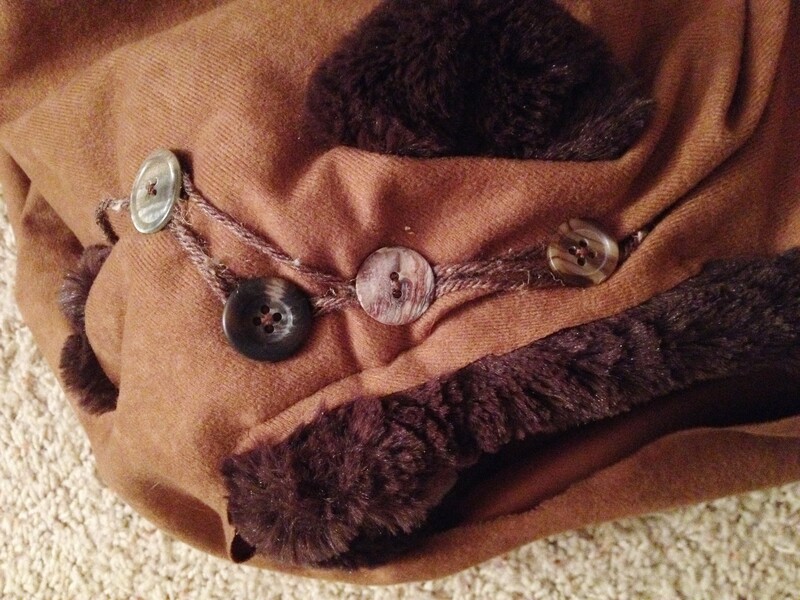 Stitch a few buttons on the ewok hood and lace some yarn haphazardly through them. Sew a few stitches to hold the ewok hood to the bear suit hood. 5. 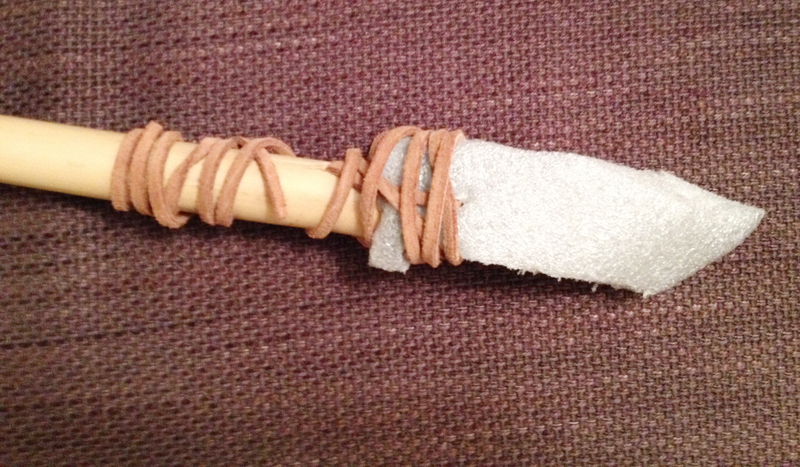 To make the spear, cut a spear blade shape out of foam. 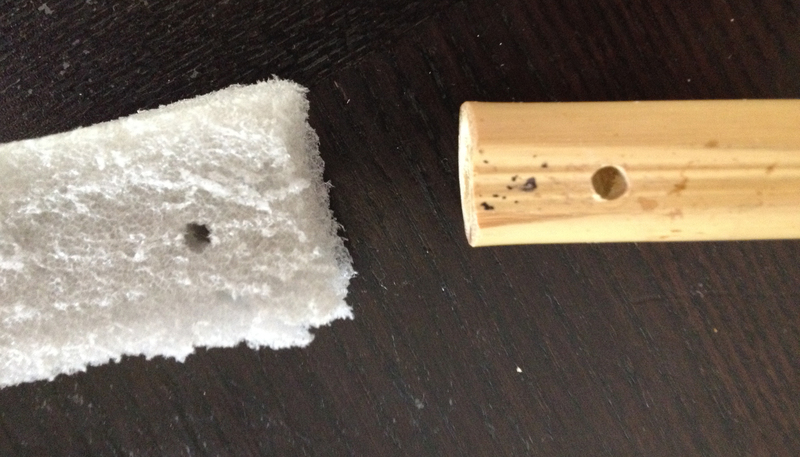 Drill a hole toward the top of the bamboo and through the foam. 6. Glue the foam blade on top of the bamboo to hold in place. Lace the leather cord or twine through the holes and wrap it around, then tie it to secure. 8. Wiggle the baby into the suit, and hand him or her a (toy) spear. Guaranteed fun!